See Elisha Rainbow Locations to get a sense of the various places Elisha Rainbow lived. I’ve also included the summary of his probate record. Louisa is his daughter (Great Aunt Lou), and Henry Powell Rainbow is his son. Wonder if this has anything to do with Granny Annie’s claim that ‘there’s always been an Edward in the family’ & her disappointment that I wasn’t named Edward, but perhaps she was talking about her own family. Don’t know of an Edward among Elijah’s sons – only heard of William C. & ‘Bob’, father of ‘Bob’s lot’. I took a look, and here’s what I have learned… Granny Annie might have been referring to either side. There is a strong tradition of Edwards on the Rainbow side, and a few Edwards on the Wallis side. Edward Rainbow (dates unknown) -> Edward Rainbow (1745-1827) ->Edward Rainbow (1772- ?1838). Elisha, Eliza Fanny and Ephraim. Elisha named two children Edward, including his first born – but both died by the time they were 5. Elisha’s brother Ephraim also named his first son Edward (1829). Eliza did not name any of her children Edward. 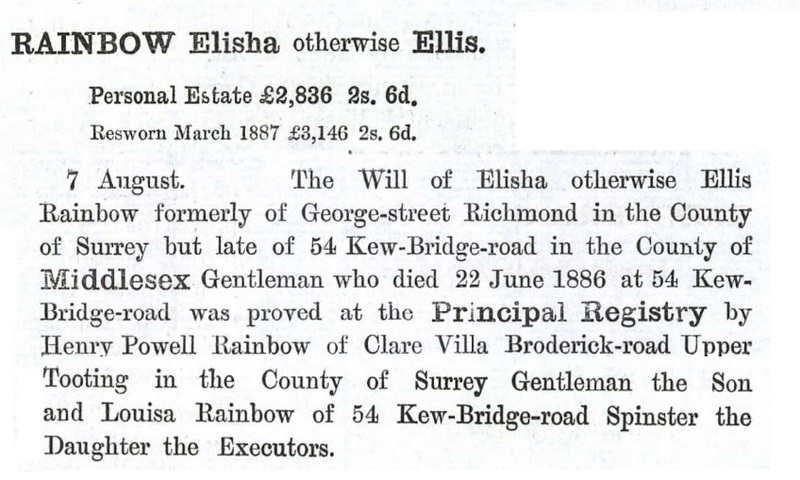 Elisha’s son William Charles Rainbow (1847-1894) named his first son Edward Rainbow (1870-1940). This would be KR’s half-brother. By the way… I have a note that he later changed his last name to Beresford – if anyone has the details of that story, let me know. Annie Wallis’ father was Edward Wallis(1830-1891), and she also had a brother Edward Wallis(1855-?). Her grandfather was David Wallis(1793-?). I haven’t been able to get further back than that yet. Wallis turns out to be a very common surname, and the most of the first names are pretty common as well (Ann, Edward, David, Arthur). In trying to push the known family genealogy further into the past, I found the story of Edward Rainbow. Edward is the 4 times great grand father of Geoff Arnold. 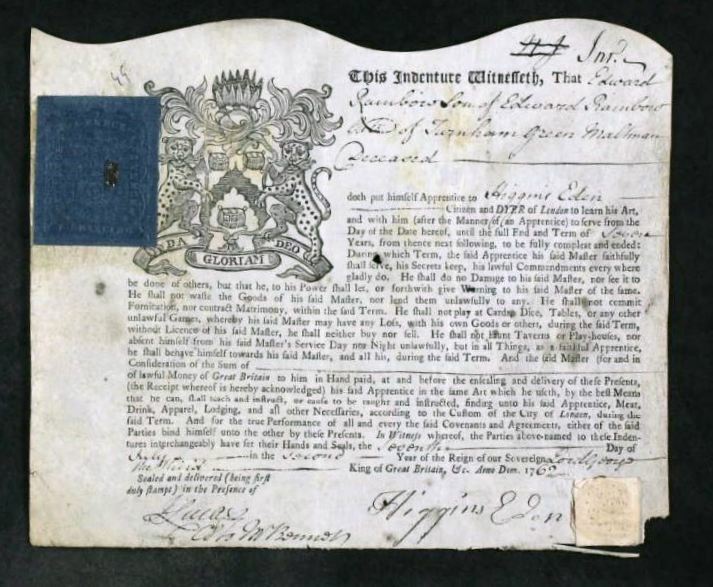 Edward (b 1745) had a son who was also named Edward (b 1772), who was the father of Elisha Rainbow. which is dated 1762. He was apprenticed to Higgins Eden in London as a dyer. His father was described as “Edward Rainbow, of Turnham Green, Maltman, Deceased”. I have not yet included his father in the genealogy, as I haven’t yet found any records that can be matched. Edward Rainbow had a business located 32 Queen’s St, Cheapside, as a silk dyer, and possibly a silk merchant. There are directory listings for him from 1782-1800 in that location. And he appeared in several court proceedings at the Old Bailey. In one he was the victim of theft. In the other proceeding in 1800, he and his son William Thomas Rainbow were accused of receiving a large quantity of stolen silk, valued at over 480 pounds (in 1800-era pounds). Here is an excerpt. The full transcript is here. Edward was convicted, while his son William Thomas was deemed innocent because he was following his father’s instructions. The actual thieves were condemned to execution, and Edward was given 14 years of transportation. In 1801, he was pardoned. He later moved to Chelsea, where his sons, Edward and William Thomas, also lived. He died there in 1828. There is a connection between Edward Rainbow and the parish of to St Garlickhythe. Several of his children were baptized there, and several descendants are buried there. For more family information, see the Family tab on this site. My Short Century is now also available on the Kindle. This is available both in the US and UK. For those in the UK, simply search for the title on Amazon.co.uk. We are very pleased with the Kindle version – it includes all the material in the print version, and looks very nice as well. Lorna’s memoir, My Short Century, was published on April 21. It is currently available on Lulu.com , and will shortly be available on amazon.com, and as a Kindle book. Lorna has been working on these memoirs for many years, and is delighted to reach this milestone. Since then, her sight has further deteriorated, and she has completed the book by dictating material, and having the entire book read to her by dedicated friends and family members. Though 96 years old, she retains her sharp memory, and recounts stories from her rural childhood, her work in the War Office during World War II, as well has her many years as an official historian for the UK Atomic Energy Authority. Lorna’s last publication was the 2007 edition of her book on the Windscale nuclear accident Windscale 1957: Anatomy of a Nuclear Accident.